Meal prep can mean different things to different people. When I say, “I do a little meal prep on the weekend,” it kind of depends on what I have planned for dinner the upcoming week. The first step is to give some thought to what you will cook. Over the weekend, plan your weekly menu, make a grocery list and get your shopping done. Shopping from a list will help you avoid those unhealthy impulse purchases. And having a plan mapped out will help you avoid the the temptation of takeout and other less healthy last minute options. If you need a little inspiration here are some of my Weight Watchers Friendly Weekly Meal Plans that might help. Basically, “meal prep” just means doing things ahead to make cooking easier during the week. As far as I’m concerned the name of the game is meal prep! Having good-for-you food ready and waiting is a savvy way to make sure you don’t opt for unhealthy choices when you’re tired and hungry. Chop up vegetables and place them in mason jars or baggies so they are ready to go for salads or other recipes when you need them. We’re much more likely to cook and eat our fruits and vegetables when they’re washed, chopped and ready to go. They’re also great to have on hand to snack on when you get hungry. And if it’s easier, opt for ready-to-go options whenever it makes sense. I love bags of already washed greens and baby carrots. Breakfast is an important meal, but for many of us, morning cooking is nearly impossible. So, get breakfast ready over the weekend. 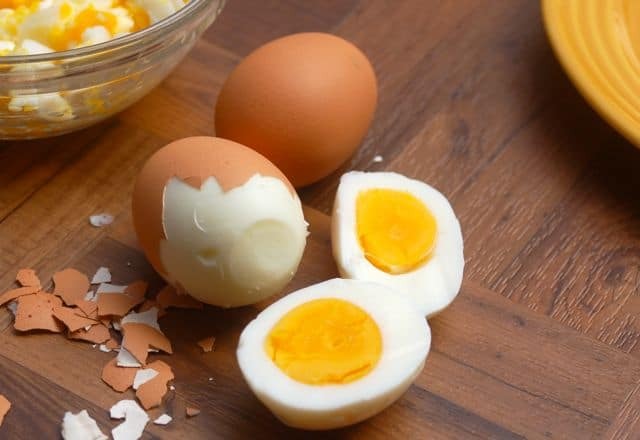 Hard-boil some eggs, make a batch of skinny omelet muffins or big pot of oatmeal or pan of baked oatmeal that can be refrigerated and quickly reheated in a few seconds. One of my quick and easy go-to breakfasts for summer is cottage cheese and fruit. When your fruit is already prepped, this can be ready in under a minute. Planned snacks can help manage your hunger levels and prevent you from going overboard at mealtime. On Sunday, spend a few minutes prepping your snacks for the week ahead. To keep things simple, plan to eat the same thing daily. Easy good-for-you options include veggies, fruits, hard-boiled eggs, cheese sticks, popcorn and nuts. Pack them in little portion-controlled containers or bags so they’re ready to grab and go. You don’t need to cook entire meals ahead of time. Instead, think about what will save you the most time and energy during the week and focus on just making those things. 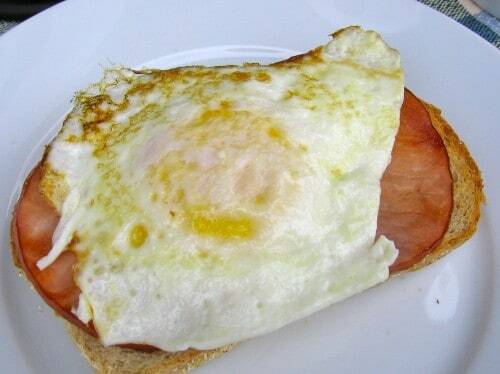 Boil some eggs, for a quick grab-and-go breakfast or snack. Sauté lean ground beef or turkey so it’s ready for tacos or casseroles. You can also grill chicken or toss it into the slow cooker and use it as a salad topper or main dish. 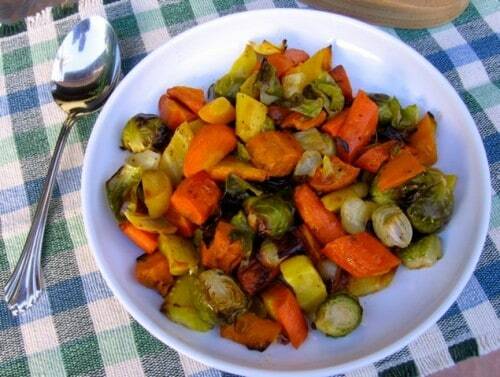 Roast a big batch of vegetables over the weekend. That way you have a healthy, delicious side every night of the week no matter how busy you are. Of course, you could steam, saute or grill them if you prefer, or slow cook a pot of beans. Make healthy meals that freeze and reheat easily. 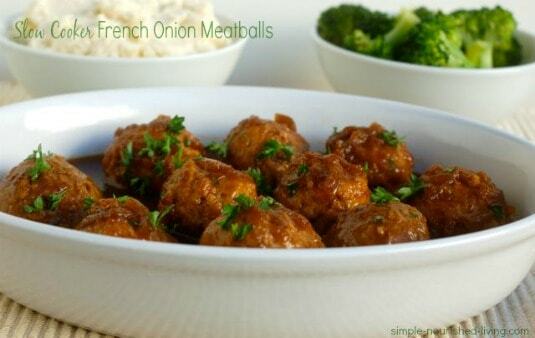 Turkey meatballs, lentil soup, chilis, stews, casseroles and sauces are all good freezer friendly options. This way you can reach for a homemade meal instead of calling for takeout when you’re too tire or busy to cook. 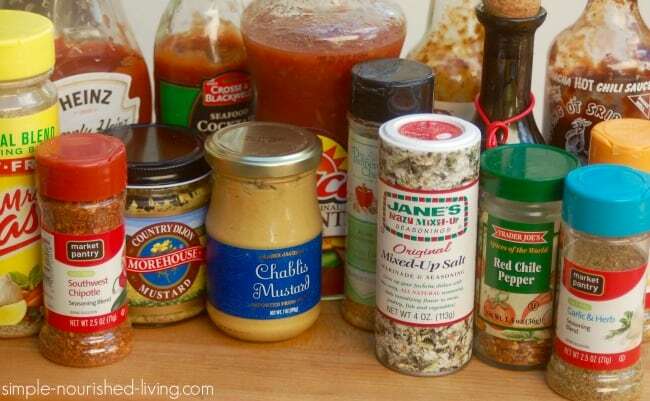 Keep tasty, healthy condiments on hand including salsa, olive oil, flavored vinegar, lemon, soy sauce, fresh ginger, hot sauce, seasoning blends and fresh parmesan cheese. The flavor variety keeps your food interesting and makes it simple to turn just about anything into an exciting, healthy meal in minutes. *I cut up red peppers, cucumbers and mushrooms. *I buy romaine lettuce and wash and cut it up for salads. I return it to the bags that it came in so it is easy to access. *I buy pre-cooked chicken bacon and Applegate chicken and sage sausages to have with Eggbeaters or soft-boiled eggs in the morning. *I buy my fruit already cut up. Costs a little more but I like the convenience. *I buy cashews and make up 1/4 cup servings for the week. *I buy Low Sodium Ham and Alpine Lace reduced fat swiss cheese. *I buy one can of tuna to have in a salad or sandwich. *I always have a box of Dr. Praeger’s Veggie Burger’s in the freezer so if I find I have no leftovers, I can make something quick instead of ordering in. *I keep Pita bread, Arnold Select Rounds and Whole Grain Rye bread in the freezer. I only take out the amount I plan to eat that week. *I make at least one dish on the weekend, usually in my Ninja Cooking System (crock pot) which I divide into the number of portions the recipe indicates. Sometimes I also make a meat loaf. I leave out two portions and freeze the rest. *All the frozen meals in the refrigerator have a label telling me what it is. Plan for times you know are difficult for you: If you know you’re famished right before making dinner, wash five apples so you can bring one each day to nosh on around 4 p.m.
Plan for cravings: Don’t ignore cravings for sweet, salty, or crunchy foods. Plan out healthy, low-cal ways to satisfy them such as making a batch of cookies keep in the freezer for after dinner. 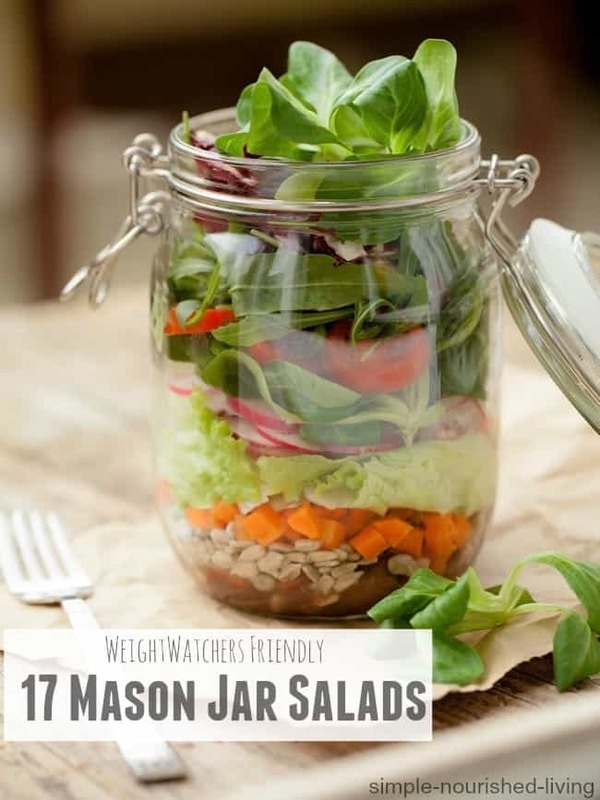 Make ahead mason jar salads for lunch. So easy since they keep well for five days in the fridge. Freeze things in muffin tins: Options like mini meatloaves, baked oatmeal muffin cups, or make ahead omelet muffins that only need a quick warming are great to have when you’re short on time. Overnight oats: Make all five of your overnight oats at once. Then, before you go to bed, grab a jar and add a little maple syrup and milk. Beans and whole grains: Make a big batch of beans in the crockpot and cook up one or two cups of dry brown rice, quinoa, millet, or barley. Freeze in one-cup servings to grab for meals later. 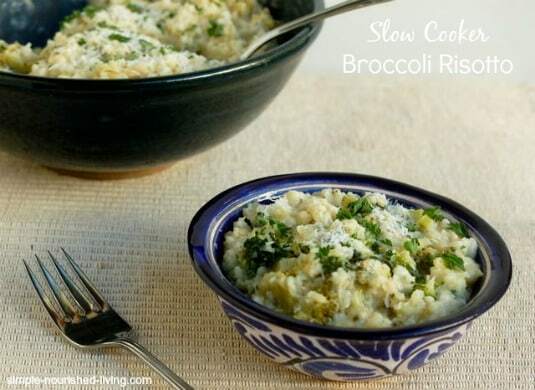 Crockpot love: For colder days, cook up a big batch of crockpot oatmeal or slow-cooker chickpea curry. Store in one- or two-cup glass containers to use for a week’s worth of breakfast or lunch. Plan one meal to indulge: This will prevent you from feeling deprived and can be just the thing you need to feel good about eating healthy the rest of the week. P.S. 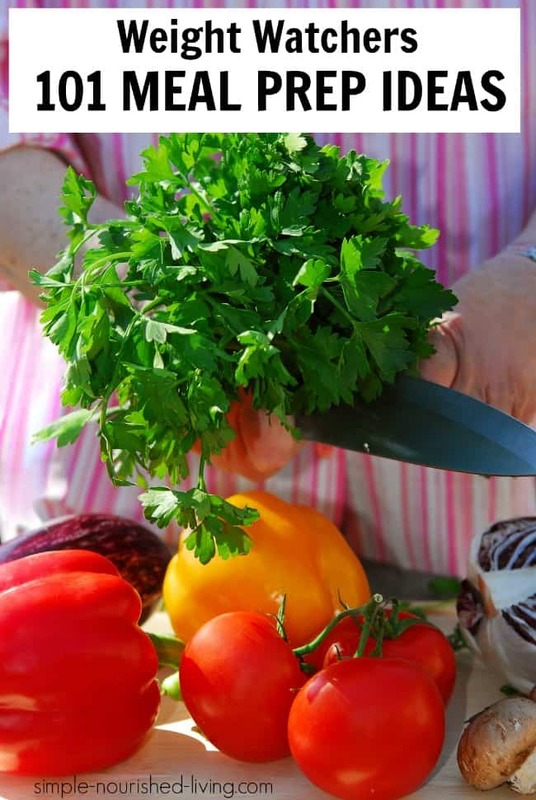 – Do You Struggle With Meal Planning? After offering a Bonus Meal Plan with recipes and grocery list as part of my Slow Cook Yourself Slim eCookbook Bundle, I got tons of requests for more. So I assembled this Meal Plan eBook, to make meal planning a breeze. 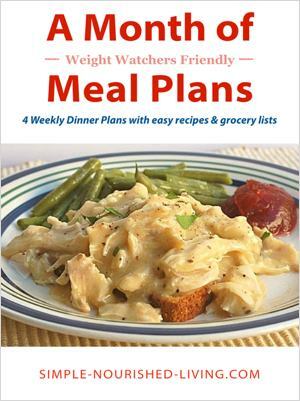 It provides you with a month (four weeks) of meal plans with WW friendly recipes and grocery lists!